George Saunders, Pastoralia: Stories and a Novella (New York: Riverhead Books, 2000), 189 pages. As I read the novella, Pastoralia, I was reminded of the trapped souls in Kafka’s writings. Here, two characters are a part of a primitive cave man display where they must prepare food over an open fire (when they receive a goat or a hare). They pick bugs and in the cave as they act as if they are real caveman. But behind the walls in their private quarters, where they can go when off-duty, there is a fax machine that is their link to the outside. There, they also have soft drinks and other luxuries that they are unable to enjoy while playing the part of a cave dweller. The people who run the theme park go to great lengths to save money (charging them for disposing their human waste) and making crazy arguments as why they have no other option. But the two employees are so dependent on the organization, so they keep playing the game, hoping each day to have a goat to roast. In “Winky,” we’re taken to a “get-rich-quick” convention where those in attendance wear hats colored for how far they have come in the process of becoming wealthy. Like many such schemes, the message is partly religious, but instead of failure due to one’s lack of effort, it’s because of others are holding you back. “God doesn’t make junk,” they’re told. “If you’re losing, somebody’s doing it to you.” The scheme sets people up to focus on their needs and to challenge or remove those from their lives that hold them back. Getting ahead is the only thing that matters. The short story, “Sea Oak” is about people trapped in lives from which they are unable to escape. It’s a world turned upside down. To make a living (in the hope of escaping to a better neighborhood), the protagonists works at “Joysticks,” where men partly strip and serve women (but they can’t completely strip) and earn titles. The best men become “pilots” although they are still stripping and serving as they parade around with their private parts slightly clad. The customers rate the men and when your rating falls to “stinker,” you’re out the door. Saunders has turned the world upside down as I couldn’t help but to think of a time when flight attendants were “sexualized” but instead of men looking at women, it’s reversed. “Sea Oak” is the dumpy community where the protagonist lives. He’d like to escape, but there is no way out. To escape, there’s the television with reality TV-like shows such as “The Worst that Could Happen.” The aunt dies and the family struggles over how to bury her. They would be in debt for seven years to give her something nice, but the funeral home as other options such as painted cardboard boxes. But she comes back to life, only to fall apart, one body part at a time. Even the hope of resurrection is hollow in this story. There are several additional stories in this collection. Saunders stories are funny, but sad. As they describe people trapped, I found them to be very Kafkaesque. Both writers describe hopeless situations. In Saunder’s stories, people place their hopes on bizarre schemes to escape, but no one (especially not the reader) believes they have a change. These stories, I found, are very political in a subtle way as if by telling them, those who are trapped with realize how the system is rigged against them and no longer play the game using rules that keep them from improving their lives. Pastoralia sounds crazy. I couldn’t even imagine having to live like that. This does sound very different … not too sure that I would enjoy the read. I had to read this collection for a college writing class. It was so long ago that I remember nothing about the book. 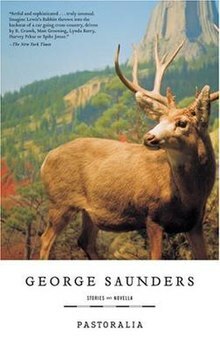 Saunders published a novel (last year, I think?) that has been on a lot of award lists. I need to read that eventually. Great review!